As talk of the “polar vortex” and winter storm warnings go away, Americans prepare to once again be active in their communities. The National Restaurant Association estimates that there is a 20% difference in restaurant business between winter and spring, with the busiest seasons being summer. As restaurants become busier, the options for customers increase as well. Estimates suggest while 40% of Americans consider restaurant service an essential part of their lives, 50% would make a different choice based on the speed of when their food comes out. Over 60% judge their next visit on the quality and taste of their food. 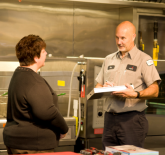 As restaurant owners, executive chefs, and kitchen staff prepare for the busiest season to come, now is the time to make sure that your kitchen is ready with preventative maintenance. Here are three simple ways to make sure your kitchen can stand up to the demand. First off, kitchen hoods can be susceptible to breakdowns as kitchen business increases into the spring. Uninspected fan belts can become brittle and break as a result of exposure to heat and grease. This results in inefficient fans, or the fan belt breaking entirely. Putting aside the actual costs of repair, a broken kitchen hood could cost you time and quality in the kitchen – costing you customers, and their dollars, in the end. Second, if you haven’t had your range burner inspected, now is the time to take a look before a burner goes out. Chefs and Kitchen Managers can tell if their burner needs to be inspected by looking at the quality and the color of the flame. A flame with a yellow color, throwing soot on the pan, or a fluctuating flame could mean your range is prime for a breakdown. In the restaurant business, time is money – and if you can’t be ready with the best tasting food when the customer demands it, your business will walk out the door. Finally, though the winter weather is fading away, now is the time to make sure your make sure your commercial refrigerator is as cold as ever. Underperforming evaporator fans, misreading thermometers, and loose gaskets on the doors are just some of the problems your commercial refrigerator unit could be experiencing, without even knowing it. Having a working refrigerator isn’t just good business – it’s a standard business requirement. Inspecting your refrigerator now costs a whole lot less than a fine – or even worse, a low rating from the Department of Health. 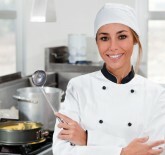 Commercial Parts and Service is available to help with all of your commercial kitchen service needs. Additionally, we can also help you get the part you need nationwide. For more information on their services, give us a call today at (800) 837-8327, or click here to schedule your preventative maintenance now. Is Luck Holding Your Kitchen Together?